Guest post from our friend (and member!) Kate at Life of A Ginger, one of our blog faves! I’ve been a customer at The Product Box for just about six months now and I LOVE the company. I can place an order every week or skip weeks when I’m all stocked up. And I can order as much, or as little as I want, a bit of this and that, so I can try a new-to-me item like Muscadine grapes, purple tomatoes, collards, or mustard greens. 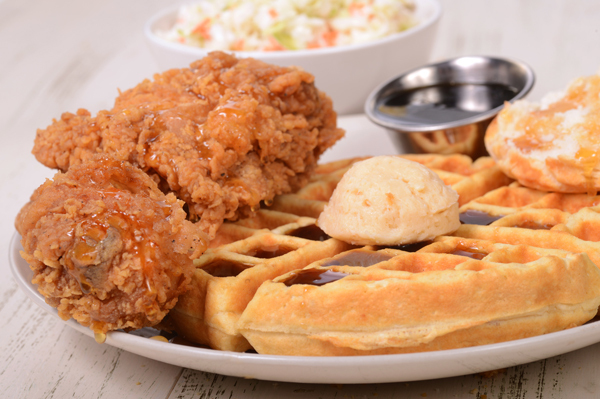 You will find comfort food all over the country but here in the South comfort food is taken to a whole new level. Fried chicken, cornbread, chicken and dumplings, shrimp and grits, biscuits and gravy, chicken and waffles, fried green tomatoes, and of course, the ever-popular macaroni & cheese, to name a few. But the food served in the South during the holidays, oh man, there is nothing else like it on earth. People go all out when they are preparing for Christmas dinner. Ham, turkey, prime rib, beef tenderloin, dressing, baked macaroni & cheese (AKA macaroni pie), sweet potato casserole, green bean casserole, black-eyed peas, greens, fresh-baked rolls, biscuits. So much food you could feed an army! With Christmas approaching fast, I took a little poll on Facebook to see what my Southern friends considered the “be all and end all food” served at their Christmas dinner. The top two answers… baked macaroni & cheese and sausage dressing. Usually made from a special recipe passed down by their grandparents or great-grandparents or it just wouldn’t be Christmas dinner. When I put a call out for holiday recipes, a friend shared her favorite traditional Southern-style dressing recipe with me. Sausage Dressing with Apples and Pecans It sounded very good, but I had to tweak the recipe here and there to make it more to my liking. I like a dressing that is, well, not dry, but I like a nice crust and I don’t want to too mushy–and this recipe called for a lot of liquid. I also substituted day-old cornbread with some boxed (gasp!) cornbread stuffing mix because I couldn’t find cornbread at any of the stores I went to, and I couldn’t wait one more day to have stale cornbread. And finally, probably the biggest change is I substituted dehydrated onions for the fresh yellow onion because I HATE onions. I don’t mind the flavor in certain things, but I just don’t like fresh onions. I was extremely happy with how it turned out; even my hard-to-please husband agreed it was delicious, and he rarely compliments my cooking. He’s been in the restaurant business all of his live and is always telling me how I can make something better (in his mind). So when he says it’s delicious, I take it as a high compliment. In my order from The Product Box this week I had fresh celery, apples, pecans, herbs, and Good Rub Organic Cajun Seasoning, all waiting to be turned into a delicious southern-style sausage dressing. Toast the cubed bread in 400 degree F oven for about 10 minutes. Remove and set aside to cool. While the bread is toasting, saute the sausage in a large skillet until brown; remove from the pan and set aside. Do not throw away the pan drippings. Melt the butter in the pan with the sausage fat over medium heat and saute the onions and celery until it begins to lightly brown. Add the apple; cook and stir for about 5 minutes longer. Remove from heat, return the sausage to the pan and season with the salt, pepper, Cajun seasoning, sage, thyme, and poultry seasoning. Taste, adjust seasonings, and set aside to cool. Heat oven to 450 degrees F. Butter a 9 x 13 inch pan; set aside. In a very large bowl or pot, add the bread chunks, and cornbread stuffing mix, and toss. Stir in the sausage mixture. Add the gravy and pecans; gently mix together until well blended. Add the beaten eggs, combine well. Bake, uncovered, at 450 degrees F for about 15 to 20 minutes, or until heated through and the top is lightly browned. Serve hot. Enjoy! While the bread is toasting, saute the sausage in a large skillet until brown; remove from the pan and set aside. Do not throw away the pan drippings. Melt the butter in the pan drippings over medium heat and saute the onions and celery until it begins to lightly brown and smells aromatic. In a very large bowl or pot, add the bread crumbs, and cornbread stuffing mix, and toss. Stir in the sausage mixture. Add the beaten eggs, combine well, then pour the mixture into the buttered 9X13 pan. Pat down lightly. Bake, uncovered, at 450 degrees F for about 15 to 20 minutes, or until heated through and top is lightly browned. To read more from the wonderful Kate – visit Life of A Ginger. And to join The Produce Box, click here and become a member today!